Our Club is off to a terrific start to our 2013-2014 Rotary year. We have had some terrific lunch meetings at noon at Westwood Country Club. We have had a wide variety of speakers this year covering a variety of topics. We have also had the fortunate opportunity of chartering a new club, the Rotary E-Club of Southern Ontario, Canada & Western New York, USA (SOWNY). We had the privilege of welcoming District Governor Kevin Crouse to present this year's Rotary International theme, Engage Rotary Change Lives. We were also happy to present him with a check for $2500 representing our contributions to End Polio Now and Rotary International. 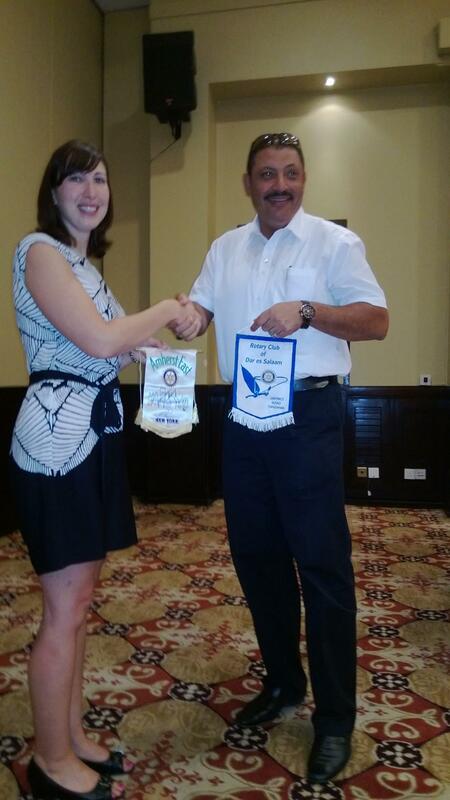 Our President Elect Katie Biggie is currently in Tanzania working on relations with the Club in Dar es Salaam to further our support of the Tanzania Project. This year our Entertainment Book sales will benefit our support of this project, these books can be purchased from any member for $25 each, we would like thank our Volunteer Coordinator Chris Genovese for working on that and our upcoming Adopt-a-Highway project on Sat Oct 12 at 9AM at Basset Park. Chris will also be coordinating our next Habitat for Hummanity project with our Interact Club. We look forward to a terrific Wine Tasting Event on October 18, at 6PM at Westwood CC. The proceeds will benefit our Foundation and several terrific local charities, please invite your friends and family for a terrific time. 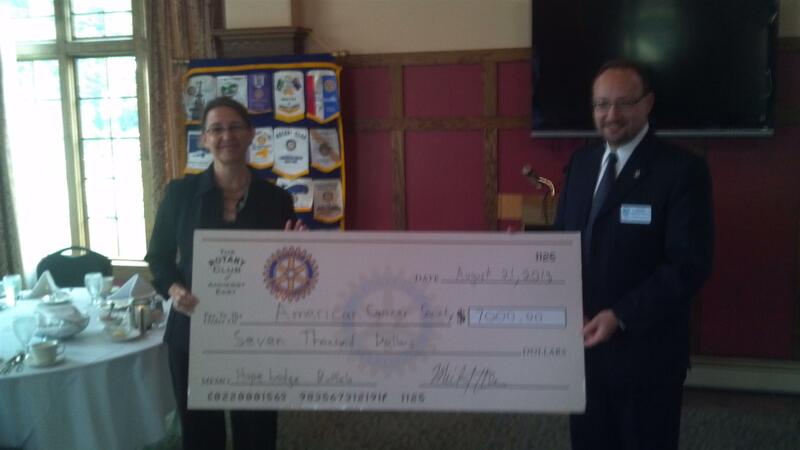 Our Spring Golf outing at Westwood Country Club netted $7000 for the American Cancer Society's Hope Lodge Buffalo. 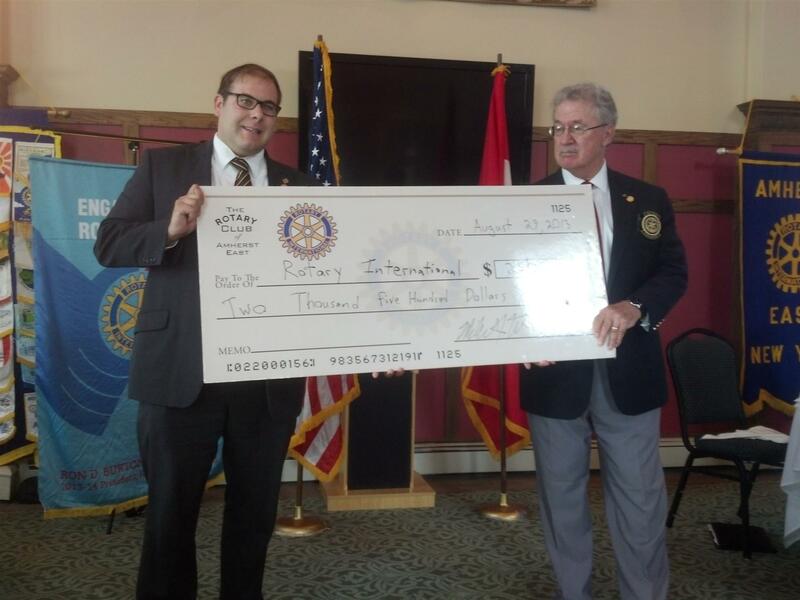 We were happy that Past President Gabe Maddalena was able to present this check on behalf of our Club.